Today’s leading oil heating technology is clean-burning and efficient. Unlike older systems, which are often outdated and unclean, modern oil heating can reduce fossil fuel consumption and help mitigate the effects of climate change. 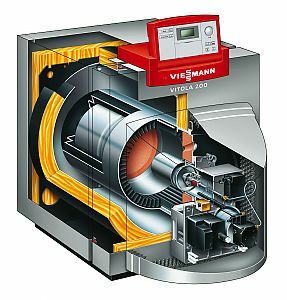 With the Vitorond 100 and Vitola 200 Series, Veissman offer a complete line of low-temperature oil heating boilers. Compared to traditional boilers that operate at a high water temperature all the time, Veissman boilers modulate the boiler water to the outdoor temperature. For you, this means a significant reduction in heating costs and a smaller environmental footprint. Veissman boilers are equipped with a unique, stainless steel combustion chamber for clean, efficient combustion and long-term, worry free operation.